climbing, walking through the Santner pass via ferrata or simply to admire the beatiful scenery and the world-known Vajolet towers. 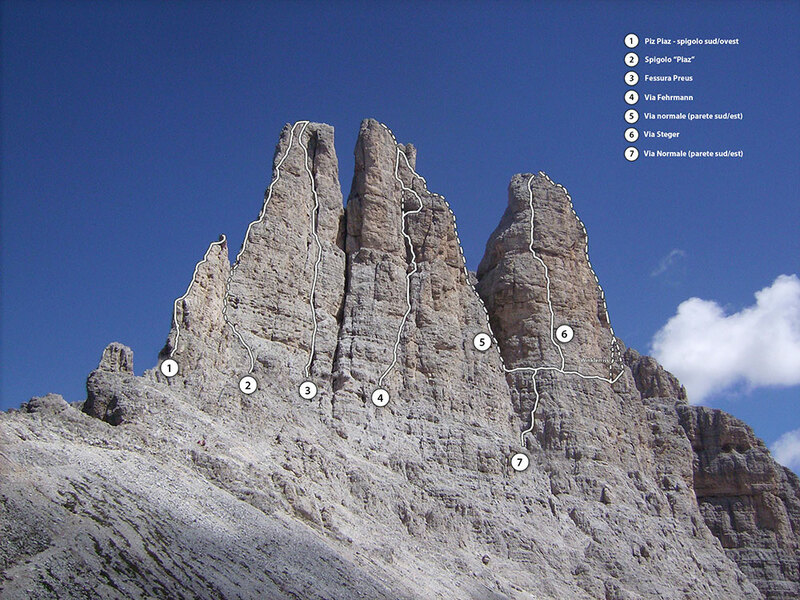 The refuge is the starting point of some of the most beautiful climbing routes in the Dolomites: the easiest Rosengarten peak, the Emma peak and the Vajolet towers. The most celebrated “Delagokante”, the easy normal route on the Stabeler tower and the less crowded but beautiful ascent on the Winkler tower. Hiking around the Rosengarten mountains along the Santner pass via ferrata in the best way to enjoy the beautiness and breathtaking views of the Dolomites. The easy trail follows the natural conformation of the rocks and it allows you to enter the unforgettable Laurin's Kingdom. It opens the door to the Gartl basin with his jewel known as Vajolet towers. 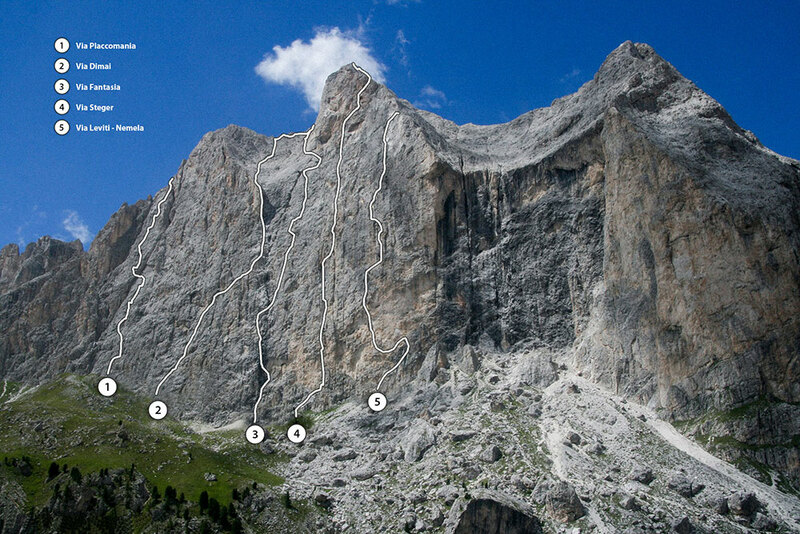 The proposed “hiking ring” here below is really one of the absolute must in the Dolomites! Starting on the left hand side of the Fronza Coronelle refuge, climb through the rock systems mainly characterized by grooves where sometimes large boulders and horizontal slabs of rock stand. 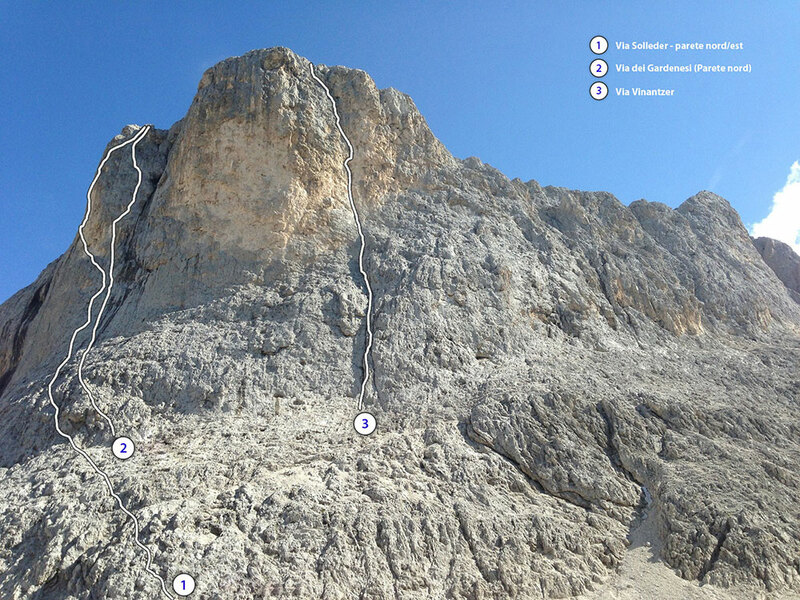 The via ferrata was completely renewed in October 2013 and it's well marked with iron ropes, steps and little laddders. Approach with care where the path is not equipped. The rock is always good and it's easy to find alternative steps which allow any overtaking without stepping on hands and feet of the slowest hikers. Arriving at the needles Schrofenegger (2650 mt), descend twenty meters down to reach the deep canyon, the bottom of which is the characteristic snowfield to go up first to the right side and then on the left. The snow usually is well beaten but sometimes icy. However, use always your equipment! The canyon ends down in a sheer drop over a hundred meters deep. A steep wall takes you out of it reaching the top at the Santner pass (2741 mt – 2,15 hours to here). We are now on the upper edge of the beautiful Gartl valley: bounded on the left by King Laurin crag, on the right by Rosengarten peak, and on the background by the strikingly slender shapes of the Vajolet towers: Delago, Stabeler and Winkler. The wonderful view opens towards the green meadows of Tyrol. From Santner pass, following the path no. 542 which overlooks the Gartl valley and quickly reach the lake and the Re Alberto 1° refuge (2621 mt) at the foot of the famous Towers. From the refuge the path descends among the boulders smoothed by countless passages, the large ravine leading to the Vajolet and Preuss huts(2243 mt). From here the path descends to the Gardeccia basin. After a couple of curves, follow the signs to the right (path no. 541), leading under the East wall of the Rosengarten. It ends with a steep climb on path no. 550 to the top of the hill, the Coronelle Pass (2630 mt). In twenty minutes you reach the Fronza Coronelle refuge. For those who wish to return to Ciampediè and then in Vigo di Fassa, without going through the Coronelle Pass: from Vajolet refuge follow path no. 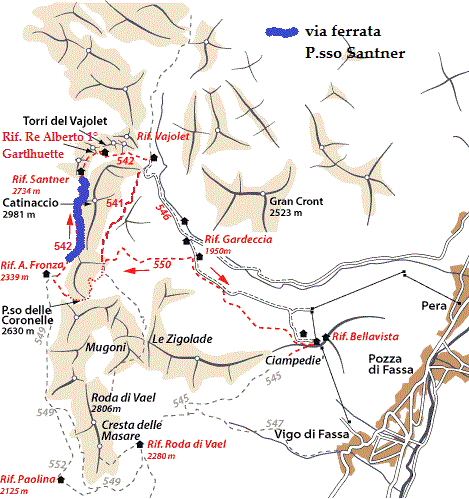 546 to Gardeccia refuge and then path no. 540 to the Ciampediè refuge. The via ferrata is not difficult, but it requires the ferrata set equipment (helmet, a purpose-made lanyards, climbing harness, carabiners with a braking device and ferrata gloves). It is common, during the ascension of the equipped path, to meet hikers who walk the route in reverse: attention to some problems of crossing and falling stones. Inquire about the snow conditions of the canyon, and the possible presence of other icy patches along the ascent route. We highly recommend you to ask for updated information about the canyon condition to the local mountain guides or the Re Alberto 1 ° refuge (tel: +39 763 428 0462, Mobile: +39 334 7246698). The ring route proposed here requires a good physical workout. We suggest to make the tour in two days, staying overnight at the Re Alberto 1° refuge, which is half way. To fully enjoy the wonder of the towers and relax for the next day! Note: tiny but dangerous tower, recently suffered the collapse of the North side. It a good training spot for those staying at the Re Alberto 1° refuge. Gears: normal climbing equipment and the use of magnesium is recommended, as it's an air climbing on polished rock where some features are required. 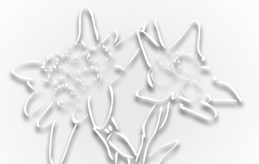 Note: the “Delagokante” is one of the most celebrated of all alpine climbs! Really pleasant ascent, too bad it ends too soon! Good rock holds but rather smoothed by the passage. Crowded on weekends. Note: very interesting climbing signed by a great man of mountaineering. A little overlooked in favor of the neighbors routes more famous! Note: very well known route on good rock often sheltered from cold drafts. Note: it's the highest point of the three towers (2805 mt). Good rock, a little polished by the passage. 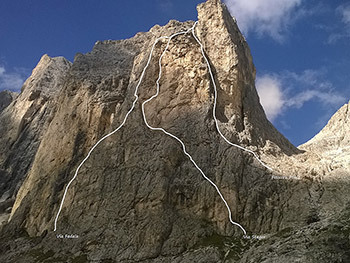 A typical route recommended even to beginner climbers. Note: beautiful and challenging route with two austere shots. The climbing is restless and puts a strain on the muscles of the better shaped climbers! Note: the least popular of the towers but no less beautiful than the others. The climbing involves passing the crack "Winklerriss". 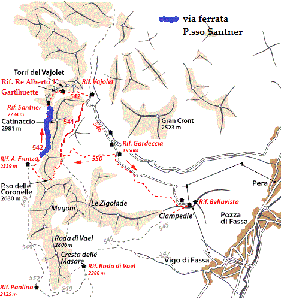 In 1887, when it was first surpassed, the upper limit of the climbing difficulties reached the Alps. Do not underestimate the polished rock. Since long time climbing the three towers in one day has always been considered a very prestigious feat. This can be accomplished from West to East or East to West, and allows you to visit them all by offering a day of "rock" climbing into a place full of charm! All the towers are equipped with abseil rings cemented-in. If you own two 60 mt ropes, you can abseil with only two descents. Note: the climbing offers an exceptional view from the summit! It's real fun for beginners as long as they have climbing basic knowledges. Note: a nice alternative way to the normal route that goes up in chimneys and corners with good rock. Avoid with low temperatures. 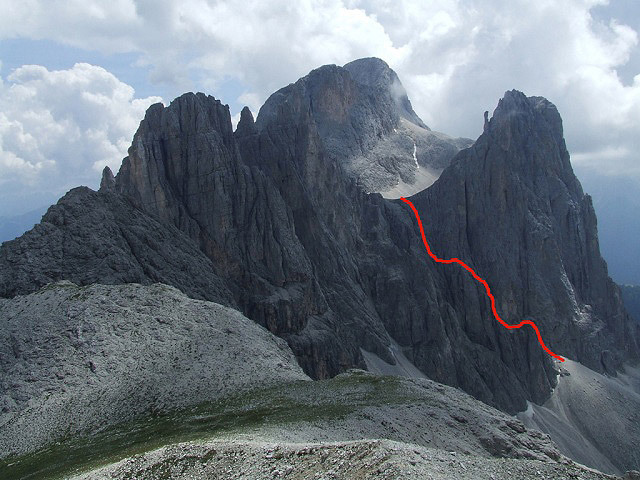 From the summit, walk down the North ridge with "short rope" to the "normal route". At the fork, to the left, follow an exposed ledge (15 mt) that leads to the first cemented ring. The first abseil descends along the channel of ascent. This is followed by two 20 meters abseils using cemented rings. Head down to Santner pass refuge. From here, the path leads to the Re Alberto 1° refuge. Abseil time 2 hours. Note: historical route, nice and logical. It runs on slabs and chimneys and alternates exposed passages (IV) to other more easy. The rock is always dry. Gear: normal climbing equipment + some pitons, nuts, cams and 10 quickdraws. Bring some kevlar threads to use where the piton rings are too small. Note: nice and logical route. It runs on slabs and chimneys and alternates exposed passages (4° pitch) to other more easy. The rock is always dry. Note: route of great satisfaction on a wall of impressive verticality. Climbing here sometimes is more tiring than fun, but it's nice to look at it from the hut below thinking "I've done it." Ancient doorway to the "king Laurin's garden", it is a climbing route with II and III grade passages. Not very popular but remarkable for the various course: the bell to ring, unusual lava flows, a tunnel in the rock to go through and the majestic view of the North side face of the towers that rise even more slender. Start from the Fronza Coronelle refuge. Turn left on a little marked path just under the impressive wall of the king Laurin's crag.  The climbing starts where a royal crown is painted on the rock. 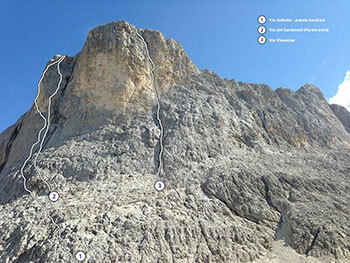 There are about 7/8 pitches, and you will come out a few meters above the Re Alberto 1° refuge. There are two ways back: down the Santner pass via ferrata or by making the tour around the Rosengarten, descending to the Vajolet refuge and then step by Coronelle pass. Climbing schedule 3-4 hours. Note: beautiful rock climbing on good/excellent rock, several times on solid rock slabs. 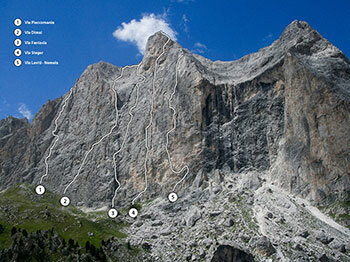 Note: the most direct route, which takes place on good rock in the first pitches and excellent in the second half. In the upper area it offers a pleasant climbing along a chimney in a big wall. Note: this itinerary is rich in variety, enjoyable and very popular. It's the most pleasant route among those of comparable difficulty. 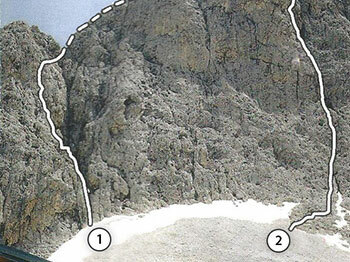 Note: the most classical route of the Emma peak, with several various climbing situations. Note: Tita Piaz, the first climber of the Emma peak, was also the first to climb the striking corner line on its East face, a remarkable bravery in the history of alpinism if you consider that he did the route in the year 1900, solo! 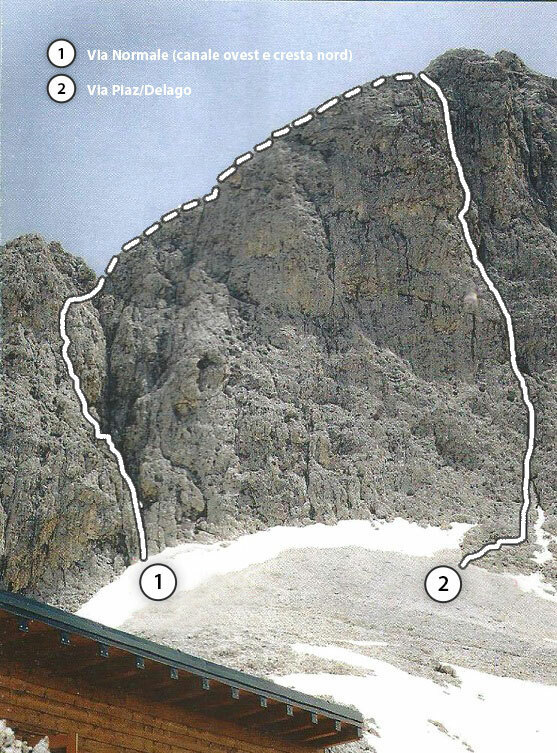 Do not underestimate the 4° pitch who presents continuous climbing difficulties. From the mountaintop follow the ridge towards the West side and, near to its end, descend in the northern direction (having the Vajolet towers in front) for about 30 mt (II grade). Then, turn left and descend for 15 mt along a hidden ramp (NW, II grade) following the direction of the Emma peak fork. A cemented ring on the left helps to abseil for 25 mt. Reach in short time the path no. 542. Abseil time in 40 minutes.